Yee-Haw! Introducing The Ranch Expansion for Saloon Tycoon, the 3D tile laying game set in the old west. Base game also available. 1,258 backers pledged $66,782 to help bring this project to life. If you are new to Saloon Tycoon, you can mosey on down below to see what it is all about! Now is a great time to jump in and pick up the whole package - including base game KS bonuses and add-ons - all at once! ... and that is why we are pleased to present this excellent expansion for our fun 3D tile laying game! We call it Saloon Tycoon: The Ranch Expansion. Develop your Ranch and raise livestock on your new Ranch board. The Ranch Expansion adds animals, new characters, new cards, new tiles, and a lot more Wild West fun for your game of Saloon Tycoon! Click the image to see 'er bigger 'n better! The following assumes you know how to play Saloon Tycoon. If you don't, it is easy to learn! Scroll on down a bit for an overview of the game. 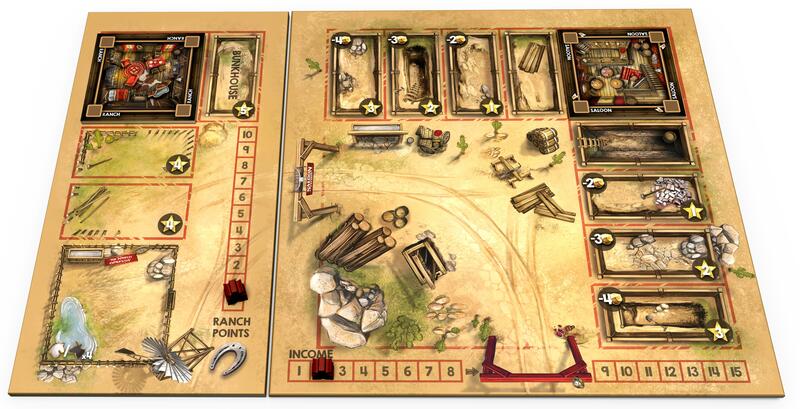 In the Ranch expansion, each player will get a new Ranch Board that fits right along side the Saloon Board. Everyone starts with a Ranch Tile on their board and a large animal pen on the board that can hold 4 animals. Each turn during the Income Step, you will earn 1 Ranch Point. You can gain more Ranch Points by playing some of the new Tycoon Cards that will be shuffled into the Tycoon Deck OR by discarding any Tycoon Card for 1 Ranch Point. Then during the Action Step you'll be able to spend your Ranch Points to buy Animals, add to your dwelling, build a bunkhouse, build Animal pens, and MORE! Cows/Horses can be bought for 3/4 Ranch points respectively. You can hold on to 'em for points at the end of the game, or sell 'em when you need some gold! And grab a water trough or two at a cost of 5 Ranch points each for a discount on future animal purchases! If you run out of room for animals, you can always buy an Animal Pen for 6 Ranch Points that will let you hold 2 more! The Bunkhouse will cost you 8 Ranch Points, but it scores you a lot of points and lets you take the best available Ranch Hand! Having a Ranch Hand around is great, but watch out for the new Outlaw - Hawkeye Harriett. Getting 2 animals first will bring her to town, and that's going to make your future animal buying and selling less lucrative. A new outlaw to make trouble at y'er ranch and some trusty hands to help out with all the work that needs doin'! Click on the image to see it bigger 'n better! Each player has access to 3 Ranch Tiles that grant different bonuses if you build them by spending 10 Ranch points. There's the Trophy Room (+10 Gold), the Workshop (+5 supply cubes), and the Planning Room (draw 2 Secret Claims and keep 1). And we can't forget the new Tycoon, Open Claim, and Secret Claim Cards that bring everything together! With simple rules but loads of new content, you'll be playing with and enjoying the new expansion in no time at all! If you are interested in the full rules, click here to read 'em now! And if you are new to Saloon Tycoon, you can pledge for the base game as well! In Saloon Tycoon players take turns taking one action on their turn. Most turns are fast and there isn't much down time between turns. First, you earn your income in gold based on the number of tiles in your Saloon. Then you will take an action. You may buy and build a tile by placing it on your board. Or maybe you will play a Tycoon Card to get some gold or give you more actions. Each turn you have the opportunity to buy supply cubes to place on your tiles. Once you have fully supplied a tile it is considered to be complete and you get that tile's bonus! Even though you normally only get one action, through card play and tile bonuses, you could accomplish an awful lot in one turn. Each player will have some secret objectives, called Secret Claims, they are trying to accomplish. There are also common objectives available to everyone, called Open Claims. These objectives will require completing certain tiles and/or attracting certain characters to your Saloon. There are some influential Citizens in town as well as some unsavory Outlaws. Build and complete special tiles to attract the Citizens for additional points, but beware the Outlaws... they can make your life as a Saloon owner more difficult. Build tiles, attract Citizens, and complete Objectives to earn the most Reputation Points and win the game! These modular expansions were bonuses for KS backers of the base game. You can pledge for it if you don't have them. These optional boards were offered when Saloon Tycoon was originally funded. You can pledge for these if you don't have them. Group pledge pricing is available for 4 or more copies. Please contact the creator via KS messaging to inquire about pledging for multiple copies. When we Kickstarted the base game, backers helped achieve the Boomtown expansions! We have more new modular expansions planned for backers of this campaign if we are fortunate enough to over fund. We will reveal more goals as the campaign progresses. *Kickstarter Exclusive in this campaign means the item will never be offered through Retail but we reserve the right to offer the item directly or through promotion outlets such as the BGG store. We are now able to ship rewards from the USA, Canada, EU, Australia, and Asia! We know shipping can be costly, but due to our strategic partnerships we are able to keep shipping as low as possible. Shipping prices vary by country and will be shown at pledge checkout, but here are some of the prices for the most common geographies. Backers of the first project may remember our HUBS system for fulfillment and wondering where it is here. We are not offering HUBS for this campaign. While HUBS worked just fine and saved backers a lot of money, the amount of work involved to pull it off was quite daunting. We believe our shipping prices for this project are very fair and hope you do too. As with all of our campaigns, we stand behind our products 100% and if you are unhappy with the game, you may return it for a refund up to 30 days after receiving it. We appreciate you being a first adopter and your ultimate satisfaction is most important to us. OUR MISSION: Van Ryder Games LLC is an independently owned and operated board game publisher that seeks to publish the best thematic games in the industry by creating amazing experiences, creating lasting connections with our customer base, and producing continuous revenue and profit growth. Saloon Tycoon artist Agnieszka Dabrowiecka is brilliant and we could not have produced such a fantastic game without her contributions. Please visit her website for more of her great art! Listen to Saloon Tycoon designer Rob Couch weekly on the Building the Game podcast! Van Ryder Games has successfully funded and fulfilled several projects. We learn more and more with each experience. Our goal is to get the games to you, our supporters, as quickly as possible. There are the usual risks of printing, shipping, customs, and other unintended delays, but you can be sure we will deliver the games to you as promised. A few remarks we want to share with you regarding our approach for our projects, including this one. 1. Communication is of the utmost importance to us. Please ask any and all questions and we will answer as quickly as possible. 2. We have planned out the goals for this project, but feel strongly about not overextending ourselves for the sake of more $. If we are so fortunate to run through our planned stretch reward offerings prior to the end of the project we will not add more on the fly. 3. Your comments and feedback are REALLY important to us. If you have an idea, concern, or compliment, please share it with us! We can't promise to implement every idea that comes our way, but we will certainly consider each one! 4. We pledge to keep a positive attitude regardless of the success or failure of this project. 5. To have fun! Kickstarter projects can be stressful, but these are games and the most important thing is to have FUN! General Support - you have our thanks! No physical rewards. Pledge any amount to support the project. Every bit is appreciated and you have our eternal gratitude. A copy of the new Ranch expansion plus all stretch rewards. A copy of the new Ranch expansion plus the resource boards plus all stretch rewards. A copy of the new Ranch expansion, the Boomtown Expansions, the resource boards, plus all stretch rewards. 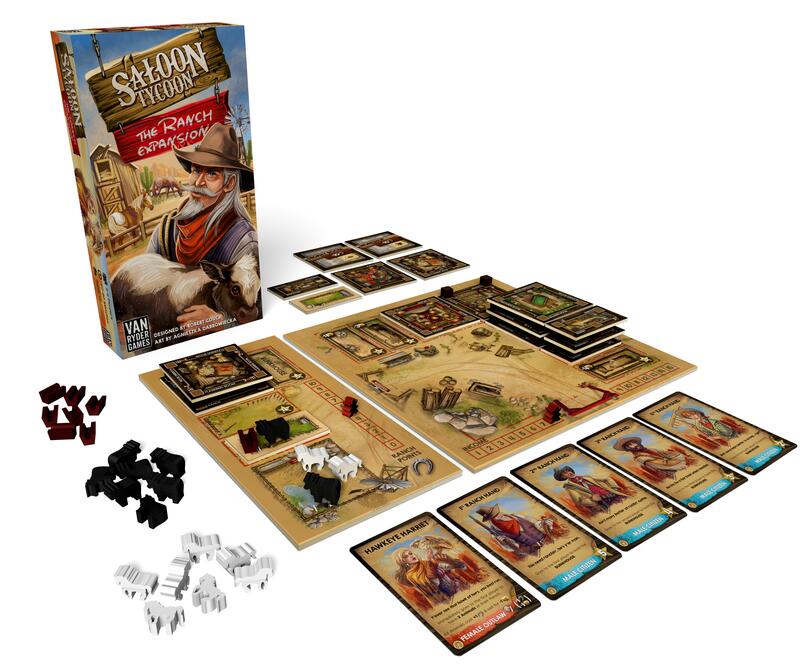 The Saloon Tycoon base game, the new Ranch expansion, the Boomtown expansions, the Resource Boards, plus all stretch rewards. After the campaign funding has been received we will ship Saloon Tycoon, the Resource Boards, and the Boomtown Expansions shipped to you as soon as the KS funds clear our bank! (Usually about 2 weeks after the campaign ends). The Ranch Expansion and any stretch rewards earned will be sent in a second shipment at a later date when the Ranch Expansion fulfillment occurs.